charity: water is devoted to bringing clean, safe drinking water to developing nations and ending the gap in water access. charity: water proves that nonprofits can make a giant impact with limited resources and the help of Google tools. Starting with a GPS device, a video camera and the Google for Nonprofits tools suite, charity: water has stretched their impact: increasing site traffic over 350%, exceeding fundraising goals, gathering celebrity support from people like Justin Bieber and using this success to complete almost 7,000 clean water projects in impoverished communities around the world. How do they do it? charity: water engages their supporters by infusing meaning, demonstrating efficiency and showing rather than telling. When donors make a contribution, whether $5 or $5,000, they’re sent a set of GPS coordinates and photos on Google Maps. Donors can easily click to see the difference they are making (tour of all their current projects here). charity: water also has a creative approach to fundraising, including the introduction of the birthday pledge which has attracted celebrity sponsors like Justin Bieber. Since they started using Google tools 2 years again, charity: water has been able to raise over $15 million through its fundraising site. The September Campaign alone exceeded its $2.4 million goal by $280,000, covering the purchase and shipment of two large drilling rigs and building multiple water projects. “In one year alone, Google for Nonprofits and our overall digital marketing strategy helped us realize a 350% increase in site traffic, a 300% increase in total number of visitors, and a 333% increase in video views,” says Paull Young, director of digital engagement, charity: water. charity: water is not done yet; their impact keeps expanding. This month they received a Global Impact Award from Google, which is designed to support organizations using technology and innovative solutions to make the world a better place. They’ll use their $5 million dollar award to develop remote sensors technology that will allow them to know whether water is flowing at any of their projects, at any time, anywhere in the world. This is the next step in transparency and data-driven solutions for the entire water sector. Want to learn more about charity: water or other groups in Google for Nonprofits? Check out this full case study and others on the Google for Nonprofits site here. If you’re interested in sharing your story, tell us here and, of course, share it with us on our Google+ page using #OurImpact in your post. 1 out of every 9 people, nearly 800 million people worldwide, live without potable water. charity: water is devoted to bringing clean, safe drinking water to developing nations and ending the gap in water access. Like our holiday card? We were having a Google+ Hangout. Check out how you can use them to catch up face-to-face with family and friends and, of course, wear cool hats. From our team to yours, happy holidays! We hope all your celebrations are filled with friends, family and lots of fun. the impact you’ve made with your donors and advocates is through an impact report that quantifies the difference you’ve made in your field over the past quarter or a year. To help you showcase that impact, our team has created this impact report template. Make sure to make a copy before using it and then customize it fit your needs. 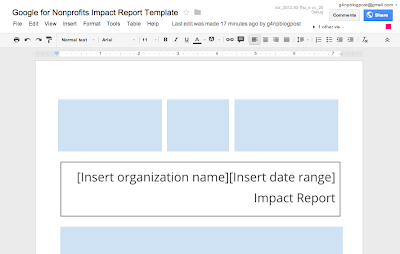 Do you already use an impact report? We’d love for you to share it with us on our Google+ page. A great way to share the impact you’ve made with your donors and advocates is through an impact report that quantifies the difference you’ve made in your field over the past quarter or a year. To help you showcase that impact, our team has created this impact report template. Make sure to make a copy before using it and then customize it fit your needs. tax-deductible donations for the 2012 tax year is December 31st at midnight. With that deadline people are searching now for charities and causes that they’d like to donate to. To help you prepare, we want to share two strategies that help maximize donations and your impact. 1. AdWords targeting now: Reach individuals who are looking to make end of year donations with relevant ads on Google. Start by creating AdWords campaigns targeting keywords related to end of year donations and tax deductible donations. If you need help finding keyword, make sure to check out Google Trends to see what and how much people are searching for keywords. 2. Send reminder emails: Make sure to remind the people who already know you and have donated about the December 31st deadline. Don’t forget to make your emails as effective as possible by telling your story and including social links. We hope these tips help you ring in donations with the new year. Do you have any tips for increasing end of year donations? If so, we’d love to hear them on our Google+ page. Just make sure to include #OurImpact in your post. We’re already in the midst of the holidays and soon we’ll be counting down the seconds until the start of 2013. While we’re preparing our toasts, another countdown impacting nonprofits is simultaneously underway: the deadline for individuals to make tax-deductible donations for the 2012 tax year is December 31st at midnight. Nuru International is a social venture committed to ending extreme poverty in remote, rural areas by offering locally-led training in agriculture, personal finance, healthcare, water sanitation and education. Beginning in Kuria, Kenya in September 2008, Nuru uses Google for Nonprofits products to help them show their impact and function as a virtual organization. Beyond using Google tools to raise awareness, the organization also uses Google Apps to help eliminate overhead costs so that funds raised are equipping people with tools and knowledge to lead their communities out of poverty. If you’d like to learn more about Nuru and how they make their impact, check out our full case study on Nuru International. And if using YouTube and Google Apps is a good fit for your organization, you can continue learning with our video tutorials and get started guides. In celebrating the way nonprofits have made an impact, we’d like to spotlight another nonprofit in our program that’s changing lives in Africa. Nuru International is a social venture committed to ending extreme poverty in remote, rural areas by offering locally-led training in agriculture, personal finance, healthcare, water sanitation and education. Beginning in Kuria, Kenya in September 2008, Nuru uses Google for Nonprofits products to help them show their impact and function as a virtual organization. WITNESS, reaching 20 years of bringing human rights violations to the world’s eyes. WITNESS, an organization that uses video and storytelling to open the world’s eyes to human rights violations, spurring public engagement and policy change, began in 1992. Musician and human rights advocate Peter Gabriel joined together with Human Rights First and Rebook Human Rights Foundation to co-found WITNESS. Since the organization’s creation, they have operated at the nexus of human rights and technology, helping millions of ordinary citizens around the world speak the truth to those in power through tools like video cameras and the Internet. In that goal, WITNESS has partnered with more than 300 human rights groups in 80-plus countries, trained over 3,000 human rights defenders, developed widely used training materials and tools for video creation and safety, created the first dedicated online platform for human rights media (the HUB), and included video in over 100 campaigns. And how did they do it? Using Google products has helped them stay organized and generate awareness. For years, Google Apps have helped traveling staff stay updated and coordinated with Gmail and Google calendar. Google Docs has enabled them to coordinate on everything from blog posts to media lists. Among other awareness initiatives, WITNESS has also created a branded YouTube channel with millions of views and thousands of subscribers. They created an extensive new channel on YouTube dedicated to Human Rights, with partner Storyful. Want to learn more about WITNESS? Check out the full case study on the Google for Nonprofits site here or join them on their Google+ Page. They’re hosting a series of Hangouts to celebrate their 20 year anniversary. Want more case studies? They’re one of our favorite resources to share how nonprofits are using Google for Nonprofits to increase their reach and impact. Check out all of them here. If you’re interested in sharing your story, tell us here and, of course, share it with us on our Google+ page using #OurImpact in your post. We know that the impact you and other nonprofits make on the world didn’t happen just in 2012. Reaching a single goal or milestone can sometimes take years. That is why we’re so excited to share in your journey and milestones -- milestones like WITNESS, reaching 20 years of bringing human rights violations to the world’s eyes. to discuss topics related to social entrepreneurs, technology for social good and philanthropy. Check out Google Giving's website and their newly announced Global Impact Awards. If you are passionate about making the world a better place, add them to your circles! Google just launched a new Google+ page, Google Giving to discuss topics related to social entrepreneurs, technology for social good and philanthropy. Check out Google Giving's website and their newly announced Global Impact Awards. If you are passionate about making the world a better place, add them to your circles! Olympics, watched the highest skydive ever and danced our way to making “Gangnam Style” the most watched YouTube video of all time. Before we jump into 2013, let’s take a look back on the impact you and the entire nonprofit community have made over the last year. Throughout December, we’ll share incredible stories of nonprofits making a difference. We’ll also provide some new templates and information to help you continue to make an impact. Most of all, we’d love for you to share your experience with us, so please join us on our Google+ page and tell us about the impact you’ve made in 2012 using the hashtag #OurImpact. Together you are making the world a better place and we can’t wait to hear more. It’s hard to believe 2012 is coming to a close. It’s been quite a year. We’ve cheered on our favorite athletes in the Olympics, watched the highest skydive ever and danced our way to making “Gangnam Style” the most watched YouTube video of all time. Before we jump into 2013, let’s take a look back on the impact you and the entire nonprofit community have made over the last year.